Remote and secret, the Auvergne is worth discovering. The Auvergne in the very heart of France, is one of the country's hidden destinations, for long kept apart from the rest of the country by its mountains, forests and wild countryside. Today it remains a region still largely untouched. Romanesque churches with black Madonnas, gorges to drive through and valleys to walk through, rivers to fish and swim in and remote plains for cross-country skiing - this is the Auvergne, a beautiful region where the skies are pure and full of stars at night. The Auvergne is the very core of the vast Massif Central in the center of France. It's a region of contrasts, stretching from Moulins in the rich Bourbonnais region of the north to Le Puy-en-Velay and Aurillac in the much poorer and rural southern Haute-Loire. 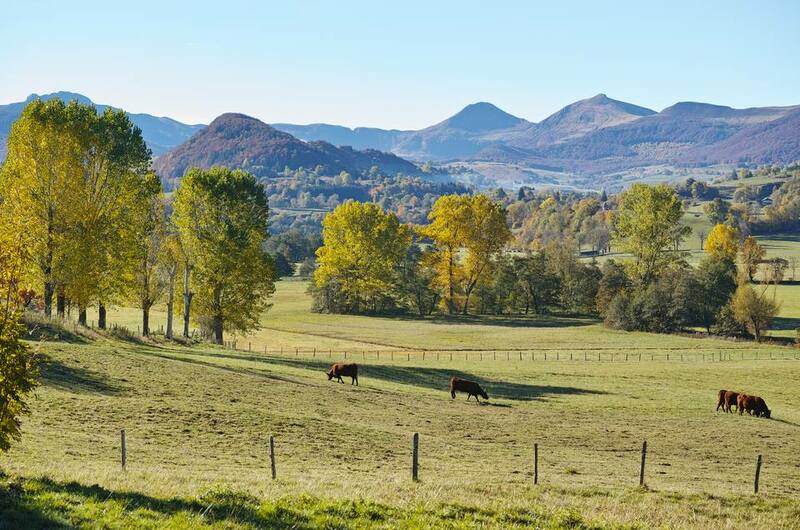 It’s a wonderful and wild part of France formed by now extinct volcanoes, or puys, that run from the Puy-de-Dôme in the north-west to the Cantal in the south-west, making this the largest volcanic region in Europe. Heavily forested, dramatic mountainsides are punctuated by river valleys: the Allier, the Loire which rises on the slopes of the Gerbier de Jonc, and the Dordogne which rises in the Monts-Dore. Still relatively undiscovered by tourists, it’s a place to walk the high plateau and scramble down to the rivers, to look at some of the most beautiful scenery in France and to visit towns with pure medieval architecture. It is also one of the great starting points for pilgrimages to Santiage de Compostela - from Le Puy-en-Velay. Made up of the four departments of the Allier, Puy-de-Dome, Cantal and Haute Loire, the Auvergne is very well worth discovering. In the re-organizing of the regions in 2016, the Auvergne became part of a larger region, Auvergne-Rhone-Alpes. There were fears that the richer neighbor would swallow up the Auvergne, but the former right-wing, effective mayor of Le Puy en Velay is now director of the whole region, so there might be more funds available for the Auvergne. Clermont-Ferrand is the largest city of the Auvergne and is an ideal starting point for a vacation in the area. Clermont Airport is at Aulnat, 7 kilometers (3.5 miles) east of the city center. The airport has connections to Paris Orly or Charles de Gaulle, Lyon, Nice, Corsica and other European cities, but only May to October flights to Southampton from Flybe. Clermont-Ferrand is 423 kilometers (262 miles) from Paris and by car the journey takes around 4 hours. If you are coming from the UK by car, take the ferry to Calais. From Calais to Clermont, the distance is 720 kms (448 miles), so it’s best to break the journey. Either take the longer route avoiding Paris and stay in Reims or Troyes in Champagne, or consider combining it with a visit to the Loire Valley and its chateaux and gardens. Clermont-Ferrand, the major city of the region, is best known as the home of Michelin tyres. But it’s an ancient city going back to Roman times. It has a delightful medieval quarter where the reputation of Clermont as a villa noire (black city) becomes evident. The cathedral was built of the black basalt volcanic rock of the region as are many of the old buildings in the winding streets. There’s plenty to see like the Michelin Adventure (the surprisingly fascinating Michelin museum); there’s good shopping, an annual International Short Film Festival at the end of January/beginning of February that is the largest of its kind in the world, and a lively and growing nightlife. Moulins. On the banks of the Allier river, 90 kms (55 miles) north of Clermont, Moulins is the delightful capital of the fertile Bourbonnais region. It has a medieval cathedral with wonderful stained glass windows, a black virgin, a superb triptych from the Master of Moulins, probably painted in 1498, some notable museums and the famous Centre National du Costume de Scène (National Center for Costume) which has just opened a Nureyev section, showing the great dancer’s costumes and personal artefacts. Vichy. Known for the puppet government of Marshal Pétain during World War II and for its famous springs, Vichy, 50 kms north of Clermont-Ferrand is a delightful, rather sedate town with beautiful belle époque, Art Nouveau and Art Deco buildings. St-Nectaire is made up of two parts: the old village of St-Nectaire-le-Haut with a Romanesque church and the tiny spa of St-Nectaire-le-Bas. It’s a strange town, most famous for its St. Nectaire cheese and with its belle époque hotels has a faded grandeur that takes you straight back to the 19th century. Aurillac in the Cantal has two great claims to fame: umbrella making and its extraordinary Street Theatre Festival in August. But it’s also full of old winding streets full of boutiques, cafes and restaurants which keep the town lively the whole year round. St-Flour in the Cantal just 92 kms (57 miles) south of Clermont is a delightful old town with a long history. It was the seat of a 14th-century bishopric and became important during the Middle Ages. The city has a cathedral with an impressive interior, and a bishop’s palace housing the Musée de la Haute-Auvergne with furniture and musical instruments. There’s a very good market here on Saturday mornings. Le Puy-en-Velay is dominated by extraordinary monuments perched on the needles of rock that rise up from the town: the Cathedral of Notre-Dame, the terracotta Madonna, the Chapel of St Michael and a vast statue of St Joseph. It was once a deeply religious city, one of the great medieval starting points for pilgrims to Santiago de Compostela in Spain. It’s also famous for lace, for lentils and for verveine (verbena) which the local distillery Pagès uses as its best known flavored alcoholic drink. The Chaîne des Puys offers spectacular scenery, mineral waters like Volvic Spring and the National Regional Park of the Volcanos topped by the Puy-de-Dôme which the extremely energetic can walk up. In the southern part, take the Plomb du Cantal cable car from the resort of Le Lioran for a spectacular view of the mountains. Vulcania is a superb theme park devoted to volcanoes. Interactive and definitely dramatic there’s a 3D film on eruptions in the Auvergne, a Dragon Ride and more. It’s at the foot of the Puy de Lemplegy, just 26 kms (16 miles) west of Clermont-Ferrand. More on theme parks in France. Tourist Train through the Allier Gorges. Take the train that runs from Langeac to Langogne through the fabulous gorges of the Allier and the national park. On the 2-hour trip the train goes through 53 tunnels and snakes beside the Allier river. Mont Mouchet Museum of the Resistance. Follow the story of the Maquis resistance in June 1944 which held up German divisions on their way north to Normandy and the D-Day Landings. Sports in the Auvergne. The area has something for everyone. You can go white water rafting, cross-country skiing, ballooning, kayaking, swimming, bicycling and walking along the well-signposted grandes randonées (numbered GR routes). Check in each local town and village for information. The Auvergne is not the place for subtle, refined food. This was a peasant culture and the food is suitably robust. The best-known dish is potée auvergnate, a kind of pot-au-feu of cabbage, potatoes, bacon, beans and turnips. Chou farci is cabbage stuffed with beef and pork. Equally filling is l’aligot, puréed potatoes mixed with cheese. Cheese is very good indeed, ranging from the cow’s milk St. Nectaire to Bleu d’Auvergne and taking in Laguiole, Cantal, and Fourme d’Ambert. Local sausages made from pork are also worth buying and there are endless varieties of marvelous honey from bees living in the forests and fields of the region. The most interesting hotel in the region is the Chateau de Codignat 40 kms (24 miles) east of Clermont-Ferrand. It’s a wonderfully romantic castle hotel with a very good restaurant set in the middle of nowhere. There are a number of very good bed and breakfasts; check with the local tourist offices for lists and information.